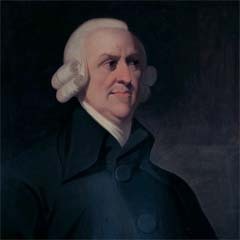 The great economic theorist Adam Smith was born in Kirkcaldy in 1723. He studied moral philosophy at the University of Glasgow under Frances Hutcheson, whose chair he would later inherit. Hutcheson, a charismatic minister, had been one of David Hume’s most vociferous opponents. 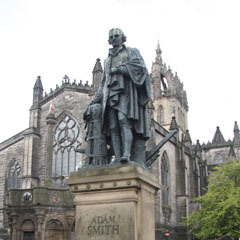 Smith also gave public lectures in Edinburgh including one on the ‘progress of opulence’, which formed the basis of his most famous work, The Wealth of Nations (1776). Influenced by an idea of Hume’s on the ‘partition of employments’ he isolated the basic principle that explains all social improvement: the division of labour. Smith is often portrayed as the prophet of neo-liberalism, but his Theory of Moral Sentiments (1759) shows a deep concern for the role of conscience and sympathy in human affairs. Portrait of Adam Smith (1723–1790) by an unknown artist.